It’s a new year. New goals, new challenges, new experiences, new dreams. A new look to the blog, and now a new post. Sorry, I haven’t been as regular with my blog posts these past few weeks. I’ve been busy working on a rewrite for a novel that has consumed time over the past year. I’ll be anxious to share more about this project as things continue. I am looking for a couple of readers that might like to get a sneak peak of the book. If you are interested in being one of the first readers of “The Sankofa Dreams”, send me a message and I’ll hook you up. Now back to our regularly scheduled blog post. Andy possessed the same passion I did for St. Louis Cardinals baseball, truck stop food, and being spontaneous. In fact, Andy may be the guy that taught me the true definition of being spontaneous. I’m having a hard time remembering a planned excursion with him as I sit and type these words. We became friends in college and lived in the same town for a couple of years after our academic careers had ended. On weekends and some weeknights, we jumped in the car to go grab a bite to eat, or drove out to the lake to enjoy the serene surroundings. On those summer nights we stood on the bank and talked baseball, movies, and biscuits and gravy. The philosophy of smothered hash browns was a sacred conversation and the source of heated debates. And I didn’t dare broach the validity of the baseball designated hitter. Doing so with Andy was a good way to ruin a perfectly fine meal or pleasant evening (For the record, I’m a National League fan in baseball–I believe the DH eliminates strategy that makes the game interesting). Andy agreed with my stance, but approaching the subject was like lighting a match to a fifty gallon barrel of oil. But I digress. Me: Andy, I have some stuff I need to pick up in Indiana. You wanna’ go? Andy: Can’t see why not. Me: Leave after work today? Andy: I think that would be fine. Me: Alright. I’ll pick you up at 5p.m. Andy: Okay. You wanna’ eat at a truck stop along the way? Me: Can’t see why not. Friends of our family still lived in my hometown and I made arrangements for us to spend the night there.We would have dinner, visit, and then get up the next morning to retrieve my belongings from storage. It would be a quick and simple trip, but a trip, nonetheless. We arrived in town about 8p.m. and had a late dinner that our hosts had prepared. Linda was like a second mother. She made sure we were comfortable, and comfortably fed. She also loved to laugh. On queue, she began telling Andy stories about me from the years before college. Linda was like a friendly Labrador Retriever injected with the energy of a chihuahua hopped up on a full pot of coffee. She possessed the ability to chatter for thirty-six hours straight if you let her. Years ago, Linda christened me with a nickname that stuck amongst family and close friends: Rickus. It didn’t take long for her to do the same to Andy. “You need a nickname too. I’m going to call you Ando. You just seem like an Ando to me,” she said. Thus began The Adventures of Rickus and Ando. Late that night while watching baseball highlights, we began discussing the state of Indiana and the points of interest that resided within the borders. For some reason we landed on James Dean and his hometown of Fairmount, Indiana. It didn’t take long for us to realize we were a couple of hours south. A quick trip was doable after loading my belongings into the van that next morning. That was it. That was all the planning we needed. Fairmount is a pleasant town. The small community is situated about an hour northeast of Indianapolis. We rolled in around lunchtime, and after a bite to eat at a diner on the main strip, we visited a James Dean museum and antique toy store. A quick fill-up at the gas station prompted the next part of our journey which would later turn fortuitous. Ando struck up a conversation with the cashier. The next thing I know, we were headed north to a cemetery on a hunt for the grave marker of James Dean. The search was easier than anticipated. We saw a handful of people gathered around a monument with cameras in hand. Absent were the dark suits and dresses customary of a funeral. It was obvious this group was fellow tourists, so we headed in their direction. The tombstone was surrounded by mementos left by adoring fans–long stem roses, flower arrangements, pictures, and a pack of cigarettes. The monument itself was decorated with lipstick marks. Twenty-four years. A brief existence. Dean’s passion for fast cars ended life and movie career prematurely. He only lived to be three years older than Ando and I were at the time. Standing there was a sobering moment as the brevity of life sunk in for both of us. The cemetery was calm and tranquil as a light breeze nudged the leaves of nearby trees. I stared at the tombstone and contemplated life. What were my passions? What road was I headed down? How would this journey play out? And who were the people, past and future, that would leave impressions on my existence, however long I might be blessed with air within my lungs and a beating heart? On that summer day I could never begin to fathom the impact people would have on my life; the fingerprints and organic dents they would leave on my personality and experience, for better or worse. After paying our respects, Ando and I climbed in the van and prepared to drive back to Illinois. We headed into town and turned east on to state road 26. Just before we reached the interstate, I noticed something ahead: A small group of bicyclists wearing a familiar logo. A year earlier I had participated in a bike tour of the Pacific Coast Highway as part of a college course during the month of January. I knew the company that outfitted our tour maintained headquarters in a nearby town. I was also aware that they led cross-country excursions, and Trevor, one of our best friends from college, had planned to participate in one sometime that summer. We pulled off to the side of the road near a group of resting cyclists. I approached, informed them I was familiar with the company leading their trip and a former tour participant, and asked where they were headed. One of the men shared they were finishing the day’s leg and spending the night in nearby Upland, at the organization’s headquarters. I asked if they knew Trevor and if he was traveling with their group. He was. He was riding with one of the early groups and was probably setting up camp at the night’s layover destination. “Ando, you want to drive up to Upland and see if we can find Trevor?” I asked. “Can’t see why not,” was his answer, of course. I love the open road. My bucket list contains a cross-country trip to be completed one of these days. I get lost in those moments on the highway. It is my safe haven and sanctuary as I pound the pavement with tunes on the radio, a beverage in the cup holder, and a cheap pair of sunglasses on my face. Liberation is found next to those yellow dashes in the middle of the asphalt. I also find it fascinating that we can encounter the Trevor’s in our lives at random times in neighboring states. Sometimes it is easy to believe we are piloting solo expeditions on lonely roads, like pioneers in Conestoga wagons inching toward the wild west. And then we come around the bend only to encounter a familiar face in the middle of this giant sphere we call our world. Decisons like dots, spontaneous or otherwise necessary, connect us with people and places that enrich our experience. Or they provide comfort in a life, that for some, teeters on the edge of loneliness or confusion. Here comes Trevor. He’s been traveling the same road as you. Stop and see if he has a few moments to chat. And you should listen for the faint voice that chimes in: Can’t see why not. “He doesn’t live in the North Pole. He lives in the barn up there,” said Kelton as we drove out to see Christmas lights. Clark W. Griswold understood something about the joys of external illumination. My kids get excited and giddy, begging to view the lights and animatronics on display at two local spots each Christmas. One of the displays has a barn. Inside the barn you can find Santa Claus, and enjoy a cookie and some hot cocoa. Kelton remembered this. And in his mind that meant Santa lived at the barn. “There is no north pole. Show me where it is,” said Kelton defiantly. Ah, Christmas is alive and well. It’s just that my son believes in Santa Claus, but NOT the North Pole. And Santa lives in a barn near the interstate in Greenville, Illinois, just in case you were wondering. People, places and things. The Christmas nouns. A story of people, and wanderers, and worshipers. A story of angelic visits, and God come down in the form of a baby, born in a stable. I want to believe in people over locations too, that the Christmas spirit is alive as we seek to love one another, and care for one another, not depending on institutions or organizations to do the good work. Places cannot love like man has the capacity to do. Gifts are but a symbol of the love in our hearts. While we may seek refuge in church buildings, homes, and spots we relate to precious memories of Christmas past, it is the faces and interactions that endure. A touch and embrace. An invitation to get together. To laugh, and share stories. To listen. To make time. This is the joy that illuminates the soul. I know something about a good road trip. It should be semi-spontaneous with only the quintessential details planned. Heck, you don’t even need to know exactly where you’re going, or where you’ll stay. Good tunes and good friends should accompany the trip. And for the love of God, don’t take lightly your choice of where to eat. The likelihood of getting lost, and then finding your way once again is all part of the process. Ando was a friend. His proper name was Andy, but a friend of mine christened him Ando because people need nicknames. And Ando liked seeing new places. We collaborated on a few post-college road trips. One excursion took us on a scenic route of Indiana observing limestone quarries and stumbling into Fairmount to find the grave marker of James Dean. But our most epic journey was a quick weekend trip to Arkansas. Ando had heard about the Christ of the Ozarks statue in Eureka Springs and was curious to see a 65 foot tall Jesus. Late on a Friday afternoon, we threw a few clothes into my Pontiac Firebird, loaded up with Ski and beef jerky, and set off for the Ozarks. We arrived for a layover in Branson, Missouri where we drove the streets, grabbed a bite to eat, and on a whim, decided to view a late-night showing of the movie, Tombstone. After speaking with locals, we identified a campsite halfway between Branson and Eureka Springs, a one-hour trip. What we had not anticipated on this summer night was that our late arrival at the campsite would culminate with a “no-room-in-the-inn” moment. All campsites were occupied. Instead of setting up a tent, we offered to pay just so that we could sleep in the car in a parking spot, but we were turned away. So we marched onward. A half-hour out from our destination, we hoped to find a cheap motel, sleep the night, and visit giant Jesus the next day. That was the plan. “No vacancy,” read every neon sign we could find hanging in the windows of the hotel offices once we arrived in Eureka Springs. As we came to discover, a passion play is conducted at the site of the statue, and church groups and senior citizens on buses flock to this destination. We had no choice but to keep driving. By 3:00a.m the idea of getting a hotel room for just a few hours was beginning to seem futile. Instead, we continued driving the back roads until we found a small parking lot by a remote hotel in the hills overlooking a lake. We caught a few Z’s until the sun began to rise. Unplanned. Only an open schedule allowed us to encounter the serendipitous surprises of a pink sunrise gracing the morning sky, the whimsical sculpted dinosaur park, a tree decorated with hundreds of shoes tied to the branches, a backwoods diner offering succulent food, and the chance discovery of a key civil war location tucked away off the main road in a quiet town. And beauty was everywhere, presented in the mountains, lakes, trees, and wildflowers. We have entered an Advent season ripe with anticipation. I listen each day as my children impatiently discuss the arrival of Christmas, presents, grandparents, and cousins. In a week we will jump in the car and make a seven-hour journey to southern Michigan. The kids are ready. They have started gathering items for the trip. And my ten-year-old daughter, following the lead of her seasoned road-trip father, has compiled a musical playlist. Christmas is about journeys: Joseph and Mary traveling to Bethlehem, shepherds descending the hills to look for a Savior born in the City of David, and Magi following a star in search of a child born king of the Jews. I’m not sure any of those involved in the first Christmas knew what to expect. They simply hit the road. Are you preparing for a road trip this Christmas? Road trips require an adventurous spirit, the eyes to see the treasures on the side of the road, and the heart that simply wants to follow a star, or see a 65-foot Jesus positioned deep in the Ozark Mountains. If you get lost along the way, don’t fret. It’s expected. Just keep driving. At some point, the road will turn familiar and you’ll return home with a story. In the end, this is the best gift. Some day, as you sit spinning tales with loved ones, friends, or family, you will realize this. 1987 was the year, I believe. I was thumbing through a news magazine probably doing research for a high school paper that was due the next morning. I stumbled across a new word that boldly led into a written piece on a topic of which I was ignorant: Apartheid. South Africa was a world away, the name, Nelson Mandela, unfamiliar. The article outlined the segregation imposed by legislation, and how it affected the rights and lives of the majority black inhabitants. It highlighted the violence and political uprisings, and questioned whether international sanctions and embargoes would ever be effective. The article was a call for equality. My world was smaller. I lived in a small town in southern Indiana surrounded by trees, limestone, and cornfields. We were passionate about basketball, and John Mellencamp. My spare time was spent playing sports, and learning new chords on a $100 guitar purchased with money earned by mowing lawns. The only segregation I knew was the self-appointed cliques in our school hallways, or the divisions caused by sports allegiances. And who did I look up to? Who were my heroes? They were musicians like U2 and Tears for Fears, the celebrity personalities of David Letterman and Harrison Ford, and the sports gods of Walter Peyton, Bobby Knight, and Larry Bird. Racial divisions, from my narrow perspective, were a thing of the past. I did not live through the civil rights movement. I had only heard stories and learned about the history of our country through textbooks and pop quizzes. And even though Martin Luther King Jr. had only been assassinated four years prior to my birth, there was a disconnect as I began to learn about our American past. You see, from age 3 to 6, I lived in Gary, Indiana. My city block was a melting pot; a young Italian girl lived a few houses down, and three Serbian brothers resided across the street. On a summer evening, you could hear multiple languages being spoken by the residents of our diverse neighborhood. My best friend in kindergarten was African-American. So was my female principal. My gym teacher, missing one arm, was, as well. These were people I liked and respected. From an early age, I learned that skin color did not define any person’s worth. We were all the same—simply members of the human population, each with our own unique perspectives, backgrounds, and gifts. I believed in equality. My experiences had molded that internal value that all men are created equal. And on that day in 1987, my eyes were opened to a bigger world where that belief was not held as truth, nor practiced in society. I became interested in what had happened within our own country. The speeches of Martin Luther King Jr. inspired me. Stories of our own segregation angered me. I held in high regard, people like Rosa Parks. In 1990, when Mandela was released from prison, I recall reading the news stories and wondering what would happen next in this country torn apart by racial divide. A revolution? A man imprisoned for 27 years surely had great passion and conviction to inspire change, but at what cost? When men have been wronged throughout history, they sometimes go to war. Captives want to be set free. By human nature, we can often lash out when our worth has been diminished by the opinions of those who are different from us, whether racially, politically, or based on religion. Nelson Mandela, elected as President four years after his release from prison, did lead a revolution. Change was ushered in, and apartheid dismantled. This was a victory for equality and opportunity. I watched the television broadcasts of the Berlin Wall coming down between East and West Germany. I remember the dramatic images of sledgehammers pounding the barrier, the spray-painted exclamations of freedom, and the iconic picture of people standing atop the wall. Mandela’s leadership was no less dramatic for a country divided for more than four decades. Yet, it was not with sledgehammers, swords, coups, or violence that unity was realized. It was through due process. And his legacy will be humble leadership that raised the banner of peace, hope, and forgiveness; elements strong enough to steer a country in new directions, and unite her citizens. The world mourns Mandela’s death today along with the streets of Soweto. I’m inspired by his words. Even more, his heart challenges me. We should each strive to be students of this life lesson. Kelton’s tiny fingers pried open the blinds so that he could look outside. He’s curious. He likes to see what might be coming down the street, or see who is walking in front of the house. And on this particular night he noticed the newly hung Christmas lights on our neighbor’s home. The boy was excited. Who doesn’t get excited about Christmas lights? Who doesn’t possess just a little bit of Clark W. Griswold within them? The twinkling and the blinking, the colors and the bright whites, the flickers that catch our attention like my little boy and beg us to gawk and wonder; to look closely. We now enter an advent season ripe with anticipation. Christmas cheer is in the air, spilling over in giddiness, hope, and the extolling of blessings…for some. Unfortunately, there are friends, family members, and total strangers within our reach that are experiencing the dark cloud of circumstances, perhaps beyond their control: sickness, loss, grief, or struggle. I setup the Christmas tree last night. Excitement was in the air, as my two children insisted on helping place the faux, spindly branches in their assigned places. We primped the artificial limbs like a mother fixing the fine hairs of her daughter before a family photograph. I adjusted the strand of lights to make sure they were perfectly placed before the grandiose lighting of the Magnificent Murphy Family Tree (all six feet and five pounds of it). The children fidgeted. I groomed and adjusted some more until it was time to plug in the lights. And in our very own Griswold way, the lights failed to turn on. I checked the plug, the switch, and verified all bulbs were in place. There would be no illumination this night. But that was okay. I would gather the ornaments and we could tell where they needed to be placed even though the Christmas lights remained dark. While dulled, the children remained upbeat. I would return from the garage in just a minute and our decorating would continue. I looked for the box. It wasn’t there. Even as I could see my breath in the cold garage, I could not find the box of ornaments. Apparently, they did not make the summer move. Frustrated, I returned to the living room to let the children know we would not be finishing the tree decorations on this night; stores were closed and a trip for purchases was necessary. They took it better than I. I don’t like leaving things unfinished. This evening, basking in the glow of newly purchased Christmas lights, Kelton sat near the tree and asked why we celebrate Christmas. Unlike a lot of my children’s’ questions, this was easy. “Christmas is about the best gift ever given: When God sent His Son, Jesus to this earth as a little baby,” I answered. “I love lights,” responded my son as he walked over to the window and peaked through the blinds. “They’re back,” he said excitedly as he observed our neighbor’s illuminated porch and lawn. Like those shepherds on the first Christmas observing the star in the sky, Kelton fundamentally understood there has to be deeper meaning to all this that we see and celebrate: The Light draws us and directs us, even when a darkness surrounds. Be the light. Show others The Light. “My cactus’ flower is officially in the last stages of dying. It’s really depressing. 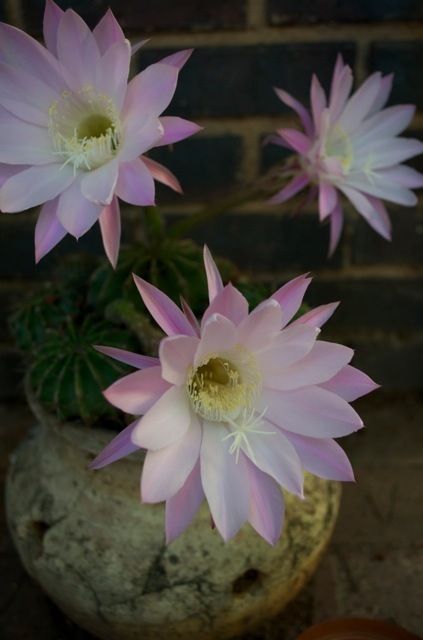 Not like I waited a whole year to see it bloom or anything,” wrote Laurissa. Admittedly melancholy, a recent thunderstorm had stomped on her excited anticipation. For weeks she had enthusiastically provided updates about her cactus, including the day she noticed four tiny bulbs emerging. My friend looked forward to the flowers that would soon peak out and greet the world. That particular message from her was giddy and hopeful. Anticipation is a natural energy source, like a caffeine boost for the temperament. Watch any child waiting impatiently for Christmas to arrive if you need proof. When we eagerly await an event or opportunity, euphoric feelings ooze through our blood providing motivation, joy, and excitement. We are anxious for the “arrival.” And so we take care of things in order that the “arrival” goes off without a hitch. We prep and pamper, we monitor cautiously. 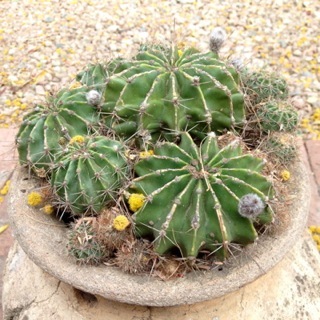 Laurissa looked after the cactus that resided in a reclaimed pot her father located in some stranger’s trash heap. And as the thunderstorms of an approaching summer began to bubble up several days a week, she would move the succulent beneath the patio table to protect it from the weather. She even used chopsticks to prop one of the fragile bulbs after a rainstorm beat down on the exposed plant. Laurissa left town for the weekend. When she returned, that is when she discovered the rain-damaged bulb. Great care had been given to protecting the plant after the previous failure, and especially given the demise of the other current bulbs. Moved, propped, positioned, adored, and watched, my friend’s excitement ripened with each passing day and effort. A simple thing providing joy, and then Mother Nature had her way. Boy, it’s frustrating, annoying, disappointing, yes? But we have all lived long enough to know that these things happen—failures, accidents, conflict, the cruel manipulation of things beyond our control, and the transition of that which is healthy and good to that which can be sick and ugly. I could end this story right here and you would nod your head in agreement, because you have witnessed and experienced the same things. Just a dose of harsh reality. But this is where the story becomes hopeful and we must continue. This is where the sun shines through the retracting stratus clouds. “I check on it (the cactus) every morning,” Laurissa wrote. “It has made four little fluffy things, but I think only the one is going to bloom which is still cool. It’s so darn pretty.” Before the storms rolled in, before the conditions were more than my friend could shelter the plant from, Laurissa was admiring the beauty of the moment, not simply waiting for the “arrival.” She was pausing to appreciate what was happening on her porch in the present. Four bulbs signified potential; the hope of a coming moment of beauty, creation glowing. And then the rains came. Because they always do. I had not heard anything more about the cactus in several days. I assumed it had shed its withered bulb, experiencing the same unceremonious funeral of its sister sprouts, and Laurissa would have to wait another year for the blooming flowers to appear. She would have to grind out a new season of patience without guarantees. So many things are about time, and timing. Then came an email. It was a picture of the cactus. Two weeks after that last remaining bulb had succumbed to the storm , three small flowers, glowing and majestic, appeared and smiled at the heavens. Quite by accident, Laurissa had opened the curtains only to see the pink blossoms before heading to work. She rushed out, snapped a few photographs, and was late to her job. But it was okay. This was a moment she had waited for because the blooms would die that afternoon before she returned home. New growth. The cactus offered a surprise, like a beloved friend you haven’t seen for years rounding the corner unannounced. What appeared dead was teeming with life. What appeared shriveled and tired was now an exclamation point. The bulbs had been infused and redeemed–a blessing personified. So my suggestion and challenge is to approach life like Laurissa did with that cactus: Care for it, do what you can, admire the beauty every day, grieve a little, and always open the curtains and look outside. You see, for me, this is the lesson—developing eyes and a heart for the process. Yes, there is truth in the cycles of life after death, blessings after disappointments, or the calm after the storm. But I want a vision for grabbing the process by the throat and watching it carefully, from start to finish, so that when the “arrival” is reached, I might have a greater appreciation for what it took to get there. I don’t want to miss the “here” while I look ahead to the “there.” I don’t want to forsake the “what” as I dream and plan for the “when.” And I don’t want to be so focused on the “fruit” that I forget about “growth” and what it takes to be in that position. I want to casually, yet intentionally look out the window and smile as I admire the beauty of the bloom.